The evil Victor Vile has stolen several classic stories from the Halls of Fiction. Solve pictographic puzzles as you travel through classic stories such as Beauty & the Beast, Swan Lake, Aladdin, and more in order to fix the fiction. 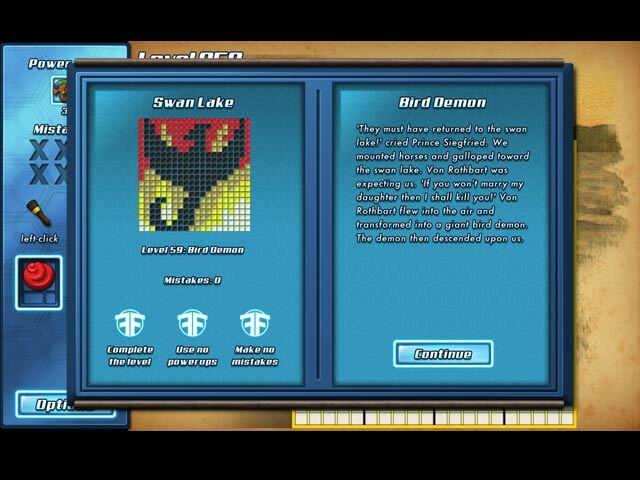 It's up to you to solve the puzzles and save the stories in World Mosaics 8: Fiction Fixers! 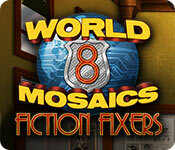 World Mosaics 8: Fiction Fixers is rated 3.5 out of 5 by 23. Rated 4 out of 5 by highwayguy from Good, solid griddler - no bells and whistles. WM was always my favorite series, as it actually had a storyline that was reasonably compelling. I'm addicted to these things, and keep buying them, pretty much regardless of which series. I liked Chroma, too, but found the puzzles frustrating, since they were designed to get you to buy powerups, which I refuse to do. At least you could wait a day and play again. This game doesn't make clear how you get more powerups/hints, though I have not used any yet. I was very disappointed that there were never any more download WM. Now, here we are! Pros... Well, the story. - And, as always, the music is pleasant. - You can back out of a wrong click, unlike other games. - Also, if you drag pins or tiles, and make more than one bad square, you only get one ding. - These get very challenging after the first book. Cons... First off, the TUTORIAL. For seasoned gridders, this is downright insulting. Let us turn it off! - Second, the controls. At least on my system, the interface feels slow and very clunky. - No autofill - bummer. Once I've filled all the tiles, I like autofill to finish the pins. - I really wish ALL the griddlers would offer a "casual" mode in which you can make as many mistakes as happen without losing the game. I hate getting almost done and losing because of a silly mistake or even having trouble seeing the different colors , etc. Just give me zero stars and let me play on! Buy all the griddlers, and dearly love them. The penguins are too easy, really, though they are certainly relaxing. Rainbow Mosaics are pretty easy, too, but give you LOTS of levels. World Mosaics are much harder, though not as hard as Hidden Clues, and certainly not as hard as all those hair-pulling 8 Floor games! Hope to see more Arizona Rose and Gizmo games, too. Bought this one, enjoying it, but as others said, it really isn't up to current standards for the genre. Rated 4 out of 5 by Kafinkee from The long wait is over! I love mosaic puzzles and I'll definitely be purchasing this one! World Mosaics is a bit more challenging than the penguin series -- was more so before this introduction of different colours (Colour Mode) - but I can also play without the ability to switch colours (Story Mode) so that's not a negative. When you've completed a row/column, the unfilled/unused squares aren't automatically crossed off for you as they are in that other series. You have to do it yourself which adds some challenge, another way you can make an error. Also, you don't always know which number in a series you've found/completed in a row or column. For example, say the number list in a row shows five ones and you filled in one of them (not at either end of the row) while working on another row/column. You won't know which of the five ones you've found because it's not automatically crossed off the list of numbers for you -- unless it's at the very beginning or end of the row or you've pegged the other squares at the start/end of the row to show that it's the 1st or last one. I won't comment on the story other than to say it's not something "exciting", not like in an adventure game. I don't care whether there's a story or not, am only interested in the puzzles. I do miss being timed in this version. Once I've completed the game, I like the challenge of beating my previous time when I play again later. Besides the choice of playing in colour or not, I also like another change I found when playing the demo. Sometimes, when playing fast, I forget my finger's on the left mouse button, think it's on the right one, which was a deadly error in previous versions of WM if I was holding down the button to 'peg' several squares at once. Each square = a mistake so I'd lose, have to start that board over. I did that once in the demo but was only 'awarded' one mistake instead of several. Another plus over the previous version of WM: far easier to see which row/column you're working in, pegs & marked squares also more clear/don't blend into the background as much as before. Rated 3 out of 5 by perrik from A disappointment for my favorite puzzle series I loved World Mosaics and still replay the 6th and 7th installments regularly. When I saw the game had been revived I bought without even trying it out. Oops. The game doesn't save its settings so unless I remember to re-toggle the left click, I end up breaking a tile because I was trying to mark it. Each puzzle has such a small number of mistakes allowed that I had to restart my game after the erroneous click - also annoying because there's no "restart puzzle" option so I had to click out and back again. Minor things, perhaps, but they added up. I completed the entire game because darn it, I was going to complete the whole thing whether I wanted to or not. And then I deleted it and started a fresh game of WM6 instead. Rated 3 out of 5 by jojoG from Hard to see the colors White color on white background with white blocked cells. Similar issues with other colors. 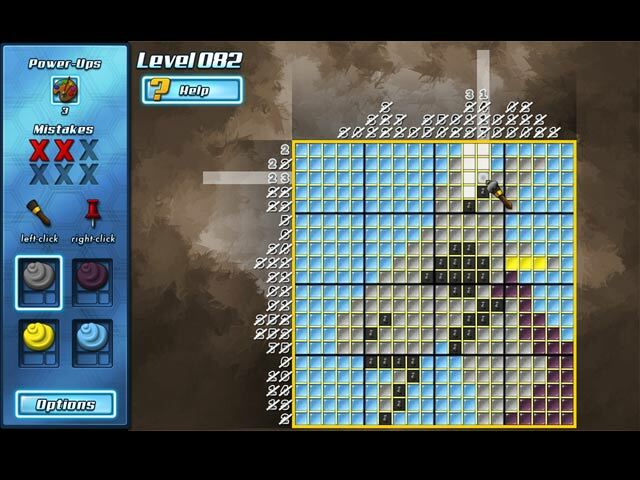 The developers need to learn from other games like Fantasy Mosaics how to make this game easier to see. I waited a long time for this next World Mosaics and I was disappointed. That didn't stop me from playing it until the end obsessively! What I do like about this game is 20 x 20 grids, but I would also like 25 x 25 grids for more challenge. Rated 3 out of 5 by millooneyum from More of the same. Somewhat disappointed. I don't know what I was expecting, but I know I expected more. This is the eighth installment of the World Mosaic's franchise and seeing as I own the other seven, I bought this game without testing the free trial. It's challenging enough but I feel like the developers were just "phoning it in", like they didn't care too much about the story line (insipid, at best) or the music (the same music from the last couple of installments). I also expected 25 X 25 grids. Not in this game. 20 X 20 is the best you're going to get. BIG disappointment. If you don't care about the story line or the repetitively boring music, then this is the game for you. Did not care for the "Color Mode". I played one grid and had my fill. Don't like switching back and forth. Give me more of the bonus grids, like in the previous installments. My advice to the developers: If you don't care what you put out, then don't bother. Rated 3 out of 5 by Wyvern49 from Good - but takes the genre in a poor direction. I have done most of the World Mosaics, so I really do NOT NEED A TUTORIAL. Why can it not be turned off? It wastes so much time!! I couldn't care less about a story line, if you do these puzzles, all you are interested in IS the puzzles. No hokey made up silliness about making it a story! I was disappointed that the grid regressed to a 10 x 10 - it is far too easy. Would have liked to see it start at 15 x 15 at least. All in all, I will not be spending money on this one, mostly because of not being able to disable the tutorial. If you are not familiar with this type of puzzle, go ahead and try it. It looks fine, just not for me. Rated 3 out of 5 by CyndiLouWho2 from Middle of the road at best I wanted to give this 2.5 stars and really didn't want to give it three. If you haven't played WM 3, 4 or 5 you should give those a try. After WM5, this series has turned stagnant. Graphics and music are about the same and are fine for this type of game genre. And there is a rather cute story line this time around. You can play with a color palette or without one. Others have given game play details so I won't re-hash them here. My biggest issue with the game is that it doesn't automatically fill in the row or column once you've figured out the numerical pattern. You have to right-click and put a push pin on each individual square you did not use. To me, this is a major downer and time waster. I already own World Mosaics 1 thru 5 and will keep playing those. I refuse to pay for the newer WM games that still don't offer any new features or improvements on the old ones. Rated 2 out of 5 by robeen from Disappointing! I have enjoyed a lot about the previous World Mosaic Games, but this one let me down. Firstly, who needed the story? It just took time away from the puzzles. 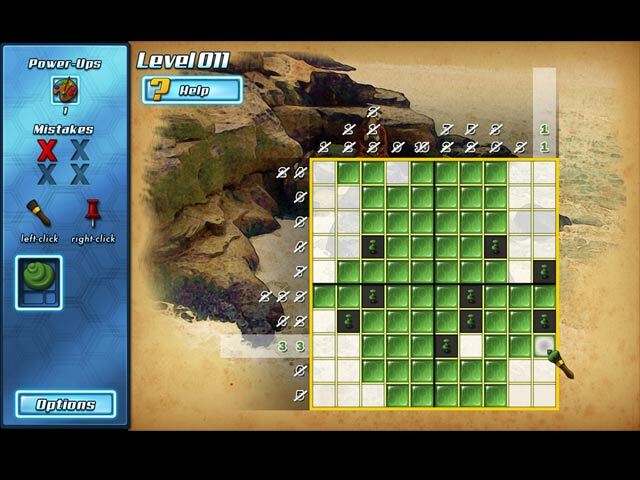 And secondly, me favorite part of the games has been the bonus puzzles with 25 squares. There are no bonus puzzles with 8, and the most we get is 20 squares. I just feel like the franchise was dumbed down for this edition. Rated 2 out of 5 by verimeri from not that good I wanted to like this game but it just has too many missing elements. All of the story games are one color until you finish, then it shows the picture in four colors. There is no auto fill or even cross out when you complete the required number of squares. The developers could take cues from the popularity of Fantasy Mosaics. Rated 1 out of 5 by moiraw00 from Disappointed I have enjoyed the previous World Mosaics, but this was a waste of money. The puzzles were easy all the way through - no real challenges. The color mode was pathetic. Don't waste you money. Rated 1 out of 5 by JessF from Never Again I own all the other World Mosaics but I will never buy another. I was so bored and unhappy I deleted the game before I finished level 3. I can live with only one color, although I found it odd that when the puzzle was completed it morphed into more than 1 color, but not deleting the unused spaces after a line is completed is completed? No. Rated 1 out of 5 by DRAGONWYN from Waste of time. No challenge, boring. Spent 1/2 of the trial time forced to use the tutorial you can't shut off. I love these games but not this one. It's already deleted from my game manager. Lots of better ones out there.Right now I'm enjoying the far kingdoms, magic mosaics and just finished fantasy mosaic 16. No comparison. Solve multicolor pictographic puzzles in order to save classic works of fiction from the evil Victor Vile!